Be Brave by Dimensions makes a great addition to any nursery! Surprise the proud parents with this adorable and encouraging counted cross stitch design. Wood trim and easy instructions are included to assemble your design into a banner. Finished size: 8" x 11.5". © Tara Moss & Sagebrush Fine Art, Inc., Salt Lake City. Kit contains thread, 14 count white Aida, 2 wood strips, craft glue, needle, and..
Cross Stitch Kits. Complete kit includes 30 count White Linen, separated floss, needle, and instructions. Finished size: 14.4" x 18.4"..
Cross stitch kit featuring a Bride and Groom Wedding Record. This package contains 14-count ivory Aida, presorted thread, one needle and easy to follow instructions. Finished size: 5x7 inches. .. Elegant Wedding Record from The Gold Collection by Dimensions makes a wonderful commemorative gift for newlyweds. A stylish alphabet is included to personalize this counted cross stitch design. Finished size: 7" x 5". Designed by Kathryn White. © Kathryn White. Counted cross stitch kit includes: • Presorted cotton thread • 18 count ivory Aida • Needle • Easy instructions with an alphabet and n.. 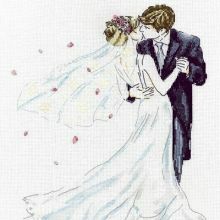 Remember your special day and feel like the first time you fell in love with this counted cross stitch wedding record. Simply elegant with a vintage touch, this is the perfect design to commemorate the union of two special people. It's stitched with cotton thread on 18 count ivory Aida in a combination of Cross and Half Cross Stitch. An alphabet is included for personalizing this precious design. ..
FROM THIS DAY FORWARD ~ A wedding sampler in Counted Cross Stitch designed by Terrie Lee Steinmeyer. A personalized wedding gift that becomes a beautiful heirloom. Alphabet/numbers included to personalize your sampler. Each kit contains 14-count Fiddler's Lite cotton Aida fabric, 6 strand cotton floss, needle, graph, instructions in English, French and Spanish. Stitch Count: 196W x 144H. Size: 14".. Counted Cross Stitch Kit with Chart, Embroidery Fabric: 100% cotton, Yarn: 100% cotton DMC, 7 stitches/cm - 18 count, Yarn organizer, Instruction in four/ eight languages, Large-square charted design, Needle, Frontsheet picture, With alphabet, ca. 17 x 25 cm / 6.8" x 10", Age category: from 10 years, Stitches: cross stitch, back stitch..
Divinely elegant with a contemporary flourish, this wedding record is sure to please the happy couple. Kit contains cotton thread, metallic thread, 14 count ivory Aida, needle, and easy instructions with an alphabet and numbers for personalizing. -- Finished Size: 7" x 5" (18 x 13 cm).. Counted Cross Stitch Kit with Chart, Embroidery Fabric: 100% cotton, Yarn: 100% cotton DMC, 5,4 stitches/cm - 14 count, Yarn organizer, Instruction in four/ eight languages, Large-square charted design, Needle, Frontsheet picture, With alphabet, ca. 18 x 25 cm / 7.2" x 10", Age category: from 9 years, Stitches: cross stitch, back stitch.. Celebrate your uniqueness with Own Kind of Beautiful by Dimensions. Chock full of pretty posies, this counted cross stitch design will add a breath of fresh air to your decor. Wood trim and easy assembly instructions are included. Finished size: 8" x 11.5". Original artwork by Lamai McCarten © Wild Apple Licensing. Kit contains thread, 14 count white Aida, 2 wood strips, craft glue, needle, and in..
Our contemporary Simple Roses Wedding Record celebrates a special marriage. This easy crewel embroidery design features coiled flowers and can be personalized with the names of the bride and groom and the date of their marriage. Finished size: 9 x 12 (22 cm x 30 cm). Designed by Raffaele Marcello. © IBD Studios / IBD Licensing UK. This crewel embroidery kit contains: • Presorted cotton thread • P..
Our contemporary Soul Mates Anniversary Record marks a special celebration. Your simple crewel embroidery stitches will highlight the printed fabric and you can personalize it with the couple's names, wedding date and number of years married. Finished size: 12" x 9" (30 cm x 22 cm). Designed by Michael Stoebner. © Michael Stoebner / Suzanne Cruise Creative Services. This crewel embroidery kit con.. Create a nice keepsake for the newlyweds with this contemporary wedding record in counted cross stitch. Where Our Story Begins by Dimensions offers a unique finishing style. Wood trim and easy assembly instructions are included. Finished size: 8" x 11.5". © Jo Moulton & Sagebrush Fine Art, Inc, Salt Lake City. Kit contains thread, 14 count white Aida, 2 wood strips, craft glue, needle, and instruc..